Hearts and Arrows Diamonds are the most beautiful diamonds in the world. The secret to their beauty is revealed here! For centuries, diamonds have remained the ultimate symbol of love. When a man buys an engagement ring or diamond gift, the goal should be to find a diamond as beautiful and special as the one who will receive it. Hearts and Arrows are not for everyone. They are for the individual that seeks the best in everything and won't settle for second best. True Hearts & Arrows are rare and limited in production; so only select jewelers can offer them. These new age, high tech creations are not your Father’s diamonds, so you don’t have to settle for an “old school” diamond from the last millennium. You can own a masterpiece that is extraordinary in brilliance and sparkle like none other. Our website will guide you in your quest for the best. 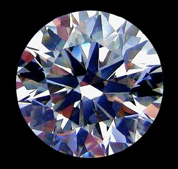 Seek out and buy a Hearts & Arrows Ideal Cut Diamond. No ordinary diamond can match the fire it will light in a woman's heart. The original Hearts and Arrows were diamonds that embodied three important design factors. First, they were cut to “Ideal proportions”, very close to those summarized by Marcel Tolkowsky in his 1919 book Diamond Design. Second, they were cut with superior physical and optical symmetry so that they would garner a grade of “Excellent” in the Japanese laboratories. The third and very important factor was that they were cut to a very specific brillanteering scheme to produce the accepted hearts and arrows pattern. This faceting scheme involves prescribed lengths and ratios as well as smaller tables sizes that are imperative in producing a distinctive, repeatable and gradable H&A pattern. In this Website starting in 1998 (updated-2010) we introduced an exciting new revolution in diamond cutting that was far beyond anything that the world has known. Thanks to modern optical science, improved precision tooling and new age technology these diamonds slowly moved in to the American market and rightly earned their place as state of the art creations. Over the years people have attempted to “cash-in” on the Super Ideal craze without having the real item and have tried to market stones sorely inferior to their Japanese predecessors. Either out of lack of understanding, greed or both, many have tried to sell rather ordinary diamonds as Hearts and Arrows. We have seen stones with H&A inscribed on the girdle that just don’t make the grade. Our goal here is to define the real item and to expose the imposters. We discuss the history of Hearts and Arrows, development of cut grading technologies, the anatomy of the Super Ideal H&A diamond and explain why they are superior to other fine cut gems. Finally, we disclose the “secret formula” for creating these incredible diamonds. After reading the information in this website the reader will understand why these diamonds are considered by knowledgeable people to be “wonders of the cutting art” and arguably the most beautiful diamonds on the planet. When considering the purchase of a diamond for someone special in your life, we invite you to spend a few minutes here, before you “take the plunge” and spend your money on an ordinary diamond.